Salt Lake County • Members want to be assured $28M gives them a firm deal to run facility. A cutaway view, looking north, of a plan for a Broadway-style theater along Main Street in downtown Salt Lake City. 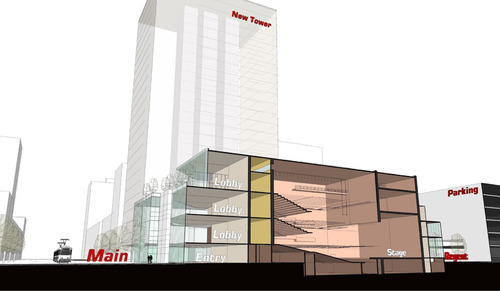 Plans for a Broadway-style theater in downtown Salt Lake City received a major boost Tuesday. After heated discussion, the Salt Lake County Council voted 6-3 to become Salt Lake City's partner in developing a 2,500-seat Utah Performing Arts Center on Main Street's east side between 100 South and 200 South. The vote means the county will contribute about $28.2 million to construction of the $110 million facility, whose curtain is projected to rise for the first time in March 2016. Funding will not be finalized, however, until a contract is reached that puts operation of the mega-theater under the control of the Salt Lake County Center for the Arts, which already runs Capitol Theatre, Abravanel Hall and Rose Wagner Performing Arts Center. In that still-being-negotiated agreement, the city has offered to split mega-theater profits 50/50 with the county (up to $2 million) and to pay the county $600,000 annually to offset losses sustained by the three existing facilities because of the new competition. But one point of the operating contract that remains to be negotiated stirred the ire of County Council Chairman David Wilde, who was joined by councilmen Steve DeBry and Richard Snelgrove in voting against the partnership. Wilde was incensed that the city could have the right to terminate the county's management contract during its 25-year tenure  a term set to match the number of years the county would bypass additional property tax revenues generated by new development in the square block around the mega-theater. "At some point Salt Lake City could say 'you're not doing well enough' and fire us," Wilde said incredulously. "That destroys the whole benefit of this for us." He also was livid about the possibility of Salt Lake City withholding a pledge to contribute $2 million to renovating the Capitol Theatre if the county did not join the mega-theater partnership  "I consider it extortion," Wilde said  especially since he calculated Salt Lake County has poured $350 million in taxes into facilities in Salt Lake City in the past 15 years. The objections of Snelgrove and DeBry were rooted in a county Debt Review Committee analysis that participation in the venture will cost the county $12.1 million, while the county would gain $8.6 million if it stayed out. But the council's four Democrats said Wilde's concerns represented a worst-case scenario that was unlikely to occur, contending it was in the city's interest to cooperate with the county, which has expertise in arts programs. And they noted Democratic Mayor Peter Corroon was taking a firm stand in negotiating contract terms whose long-term benefits would offset the short-term losses cited by DeBry and Snelgrove. The Democrats were joined by Republican councilmen Max Burdick and Michael Jenson in voting for the pact. Burdick said the mega-theater would support and benefit from the LDS Church's $1.5 billion investment in the City Creek Centre shopping district, adding "I take it as a compliment that Salt Lake City wants us to operate it. "It feels good to me. It feels right. We have major government entities coming together on such a remarkable, beautiful facility for us, our kids and our grandkids," he said. "I just have great faith in how it's being done and great faith it will come together." Added Jenson: "It's a better project if the county's involved than if it is not. We're in the arts business." Helen Langan, a senior adviser to Salt Lake City Mayor Ralph Becker, lauded the council's action. "This project has great economic development advantages and we think Salt Lake County will be a phenomenal partner," she said, emphasizing her belief that the project will have financial benefits for the whole county and state. Corroon echoed that point, adding that county management of the facility "makes sense [and] will help protect the overall arts community in Salt Lake County." Downtown Alliance Executive Director Bob Farrington said the city and county have cooperated on numerous initiatives, and "that's what the community and taxpayers want to see  different governments working together on a common agenda."